Nolan’s Bank Performance Study provides insight into the business of banking and changes over recent years that can have potential impacts on the future. We look for significant upward and downward trends in Key Ratios at the line-of-business or functional level. In reviewing this year’s data, another compelling trend emerged from the raw numbers as we aligned the results from the current year with the two prior years. In examining trends in the benchmarks (top-quartile performers) and averages of our participant banks, we saw a clear trend of increasing Consumer Lending Expense as a percentage of Consumer Lending Income compared to the last three years, with a significant spike upward from 2012 to 2013. This data prompts the question, “Why are expenses as a percentage of income increasing and impacting product margins so significantly?” Is it a revenue problem or an expense problem? Or both? While each situation is unique, the revenue side of the equation itself is perceived to be driven largely by things like marketplace factors and sales techniques. We have found, however, that the expense side is driven primarily by end-to-end process efficiency (or lack thereof) and technology, which can directly impact revenues in addition to expenses. Inefficient processes often result in poor customer experiences, which can prompt customers to go elsewhere. systems, underwriting and all back office functions. Unit costs and a baseline end-to-end process cost were developed. Once completed, this end-to-end view provided new visibility and insights into the process and it became “wallpaper” for the team’s workshop sessions. Loan application completion required a high number of “touches” between originators and clients and originators and underwriters, significantly impacting cycle time and ultimately application withdrawal rates. Incomplete loan applications were submitted by some originators, which were not caught by system edits, which caused significant downstream duplicate handling and rework. Functional managers were working hard to manage their particular function, but had limited knowledge of other parts of the process and organization. Performance metrics were limited and activity-based within a functional area, as opposed to shared metrics across functional areas involved in the process. There were also no metrics in place for application submission quality. Back office functions reported up through a different set of management that did not connect except at the level of the CEO’s direct reports. This structure made cross-functional improvements difficult to implement, causing employees to feel powerless to create positive change. The technology environment provided its own set of challenges. There were more than ten systems involved in consumer loan processing, insufficient system edits and multiple points of duplicate manual entry between systems. These complexities were negatively impacting turnaround times. Also, existing system functionality was not being fully leveraged. The team developed a comprehensive list of opportunities for improvement and utilized a “leap to the ideal” approach, where characteristics of the ideal consumer lending process environment were identified in various categories, leading to the development of a “Goal-State” process map. Recommendations for moving toward the Goal-State were categorized as either shorter-term or longer-term. The Goal-State map was also enlarged to poster size and became an essential reference for the organization going forward. Both maps were used extensively as recommendations were presented to executive management. End-to-end time spent handling new applications was reduced by more than 50%. Average new application cycle time (average days from application to upload) was reduced by 70%. Improved revenue by significantly increasing cross-functional capacity over time. A clear realization and new focus on fully leveraging existing technology and pursuing new technology solutions over time to reduce manual processing between systems. 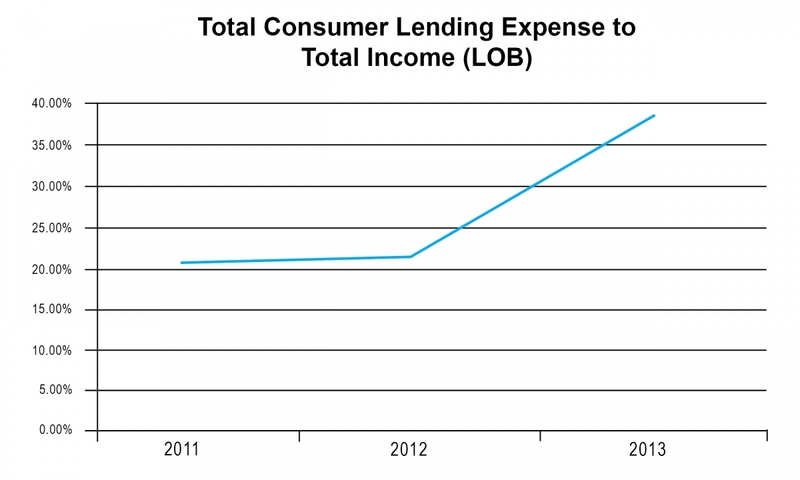 Many factors drive consumer lending profitability. In this example, The Nolan Bank Performance Study data provided product profitability insights and revealed this bank’s Consumer Lending Expense to Income trend was deteriorating, much like that of other study participants. The end-to-end view identified an inefficient process that was gobbling up operational capacity that should have been available for sales and origination efforts. Achieving end-to-end process visibility with accurate metrics was the key to demonstrating the need for accountability at the source and for identifying where improvements could be made to impact both the expense and revenue components. If you would like additional information on Nolan’s Bank Performance Study, information on the case study cited above, or our improvement work with banks, I invite you to visit our website at www.renolan.com/banks or contact me directly at mike_meyer@renolan.com.